Manufacturer of a wide range of products which include ethylene oxide gas sterilizer, ethylene oxide sterilizer and industrial eto sterilizer. Ethylene Oxide Gas Sterilizer are considered to be the best one and we are proud to announce that we are among the successful manufacturers of this machine. We pay attention towards making this product with lots of advanced features. The machines made by us are able to work for a long time. These Ethylene Oxide Gas sterilizer are often used for the purpose of sterilization of the large quantities of products that are not possible to be sterilized with the help of steam. When the gauze or non-woven materials like the disposable gowning are being manufactured, they necessarily need to be sterilized prior to entering the hospital. These are being often sterilized with the help of Ethylene Oxide to kill harmful germs and spores. Delivery Time: 2-3 weeks form PO. Control system provides strict control of vacuum, chamber temperature, exposure/aeration time etc. To assure consistent, accurate performance. Cycle progresses automatically through vacuum, exposure, sterilizing, and aerating phases which held in memory even if a power outage occurs. The screen on the control panel indicates specific phases during the operation. A leak test function takes a provision of any leakage possibility and the sterilizer can be started only when the vacuum is completely drawn. Use individual gas canister of 100% ethylene oxide. It eliminates potential leakage from tanks or fittings. Negative chamber pressure ensures that gas cannot escape into operating area. There is no release of E.O gas until puncturing occurs inside the sterilizer and only after the door is locked and a complete vacuum is drawn. Aeration system reduces the potential for operator exposure to EO. An effective air filter is used to prevent contaminated air from entering the chamber. The construction of chamber and cabinet are made of high-quality stainless steel for high performance of corrosive resistance against. The material of construction built for the internal chamber is of SS 316. The cycle does not start unless the chamber is locked also door-unlocked signal is displayed on the control panel. Delivery Time: 20-25 days after receiving advance payment. 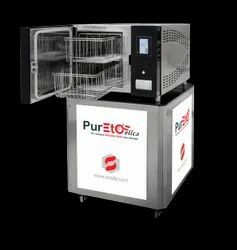 Among different types of sterilizing machines, Industrial ETO Sterilizer Machine is being used in a huge way. We are famous for producing these machines in a large way and these are developed by our expert team by using advanced technologies. Again we use top quality stainless steel to make this machine. All types of medical devices as well as instruments can be sterilized with our designed machine. We are using cutting edge technology to design this machine and to make it worthy for the industry. Proper packaging is done to get that delivered at the client location in undamaged condition.